I attended my first ASTAR (Awakening Spirit Through Art) art class last night. Amazing. I loved it! I am very excited about the journey that lies ahead. 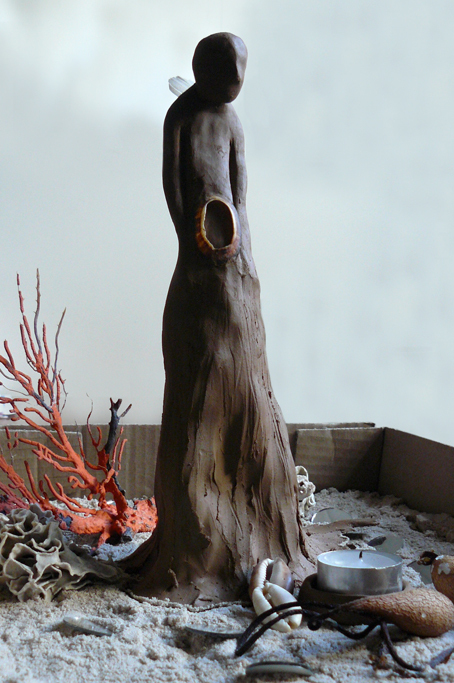 We were to create a Guardian Figure out of clay. We started off by holding a large lump of clay in our hands, and with our eyes closed were given a guided visualisation to do. At first I saw a tall man, broad shoulders, strong, caring, crouched down, embracing and comforting a tiny, fragile me. As the meditation continued my figure became very tall and thin, gentle, feminine, flowing and radiating light. I thought it was a woman with a flowing skirt and was then confused, was my guardian figure a large man or a tall thin woman? 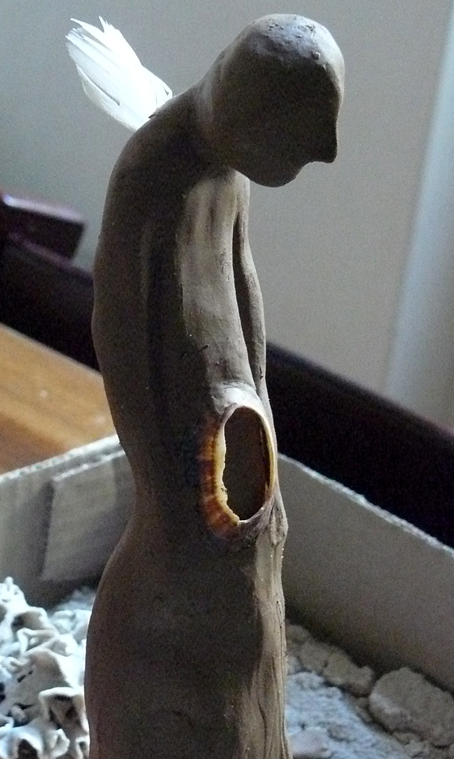 When we started working with the clay I found myself moulding it into a tall, thin, flowing figure of a man. He reminded me of my late grandfather (whom I never met) with his bald head. 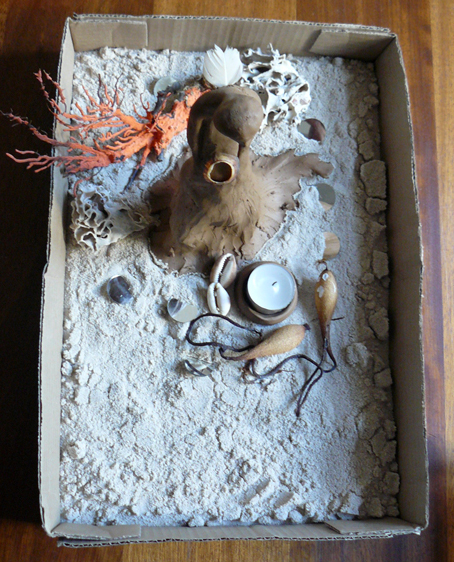 When we'd completed our clay objects we were given a cardboard tray of sand and asked to select anything we wanted from a table of 'found objects'. This included beads, old jewelry bits, sequence, feathers, seed pods, shells, bits of fabric, you name it. At first I chose an ornate blue heart bead; a pretty, broken, ornate pendent and a pretty, patterned, antique tea strainer that would make a lovely impression into the clay. But my Guardian figure didn't like any of them and I found myself putting them all back. 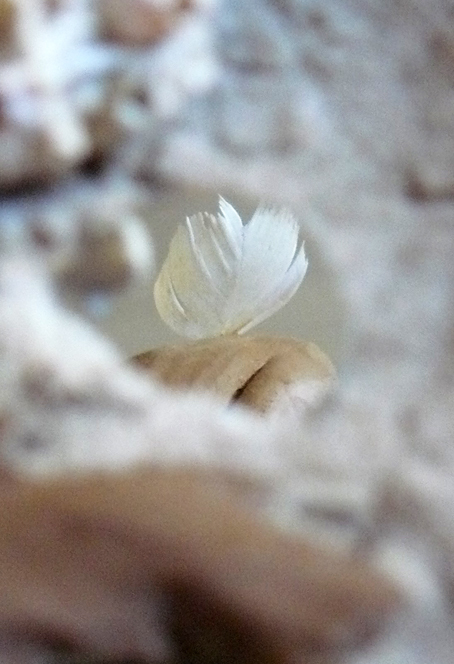 I've never been big on sea shells and coral, but that is what I found myself returning to my desk with... a selection of things from the sea, and a small white feather. I arranged, and rearranged my objects. I balanced a broken oval shell on his head like a halo, but was then moved to embed it into his body, like a pregnant tummy that had opened up. A tea light candle, 2 kelp pods with 'umbilicle cords', 2 cowry shells, 3 beautiful pieces of coral, and 7 round, light reflecting, mirror mosaics now surrounded him. 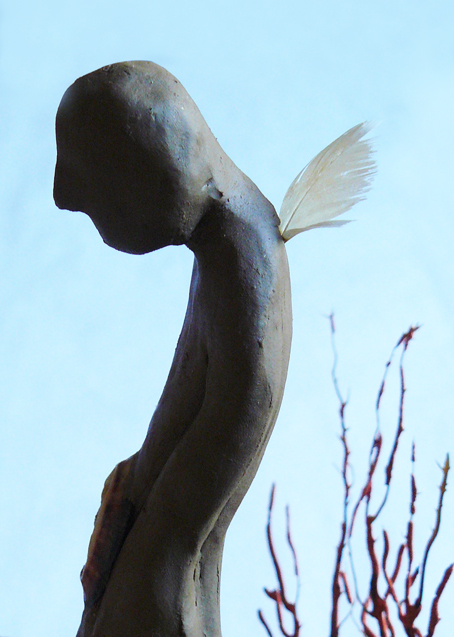 And the small white feather I inserted between his shoulder blades, like a wing, or a fin. 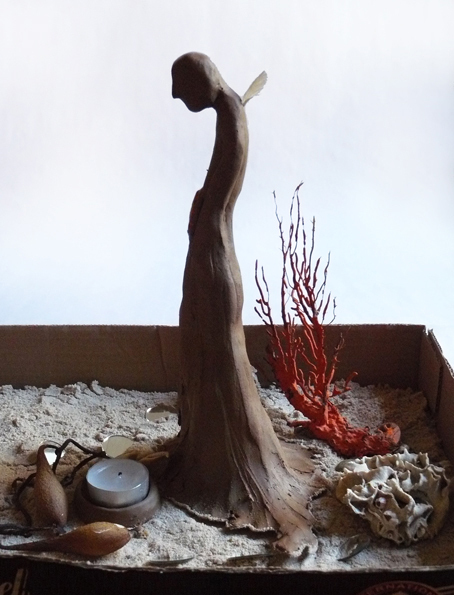 When our creations were complete, we took pencil and paper and did a short guided meditation. We asked our Guardian Figure what their name was and what message they had for us. We wrote down the first thoughts that came into our minds. 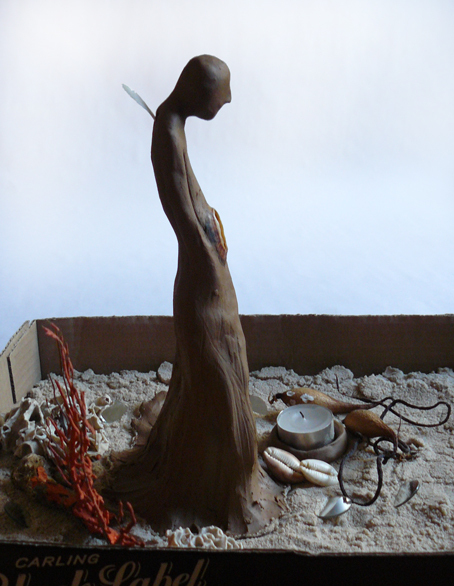 My Guardian Figure's name turned out to be the same name as a late friend, who sadly passed away at sea a few years ago when I was pregnant with my twins. My message that I received was a reassuring one about my twins and my older son, a compliment about me as a mom, and a blessing for my family. I'd spent time with this friend's family very recently so he had been on my mind, but I was not consiously thinking about him during the art session. Wendy, this figure and the story behind it is breathtaking, and if I'm excited about where this course will take you based on just one class then I can't imagine how you must be soaring. Well done!